I love traveling. But traveling in jeans? Not so much. Trust me, it is supremely uncomfortable. Like the discomfort of squeezing yourself in the economy class or a car for hours is not enough, wearing uncomfortable pants only aggravates the whole experience. The best solution for this problem? Travel pants! Join me on this ride where I’ll tell you all about the best travel pants available on the market right now. But first, let’s talk about what exactly travel pants are. Travel pants are breathable, high-quality, lightweight but fashionable pieces of garments. Though some of us prefer wearing leggings, tracks, pajamas, or one piece dresses while traveling, they are not really designed to suit the needs of a traveler. This is where travel pants come into the picture. Things like fabric, design, waistband, and fit are some important factors to consider buying travel pants. 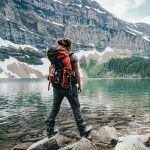 Now that you know what to look out for, let’s check out some of the best travel pants you can get your hands on. If you travel a lot for business, you know the pain of keeping your formals looking impeccable on the flight while still feeling comfortable. These ankle-length pants from Uniqlo are perfect for corporate travelers. With comfortable movement, style, and design, this checks all boxes for good work travel pants. These are the perfect travel pants that can take you straight from the flight to exploring the city without changing out of them. 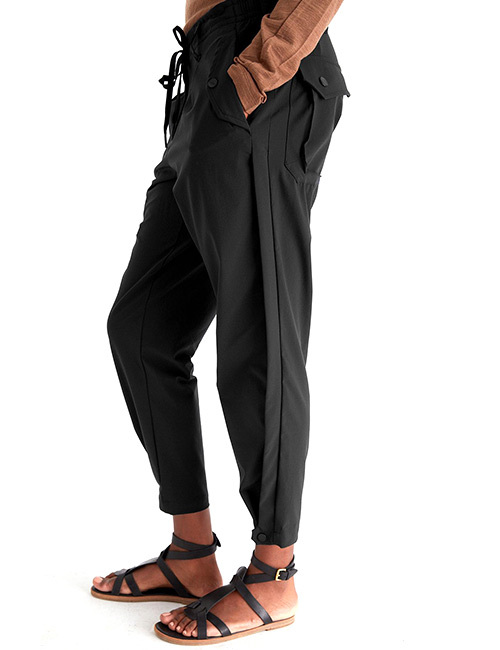 Pashko pants are crafted from a Swiss-made Tech-fabric and are ultra-comfortable. The pleated style and tapered fit of these pants make them look very chic. They look great with sandals, sneakers, and boots. 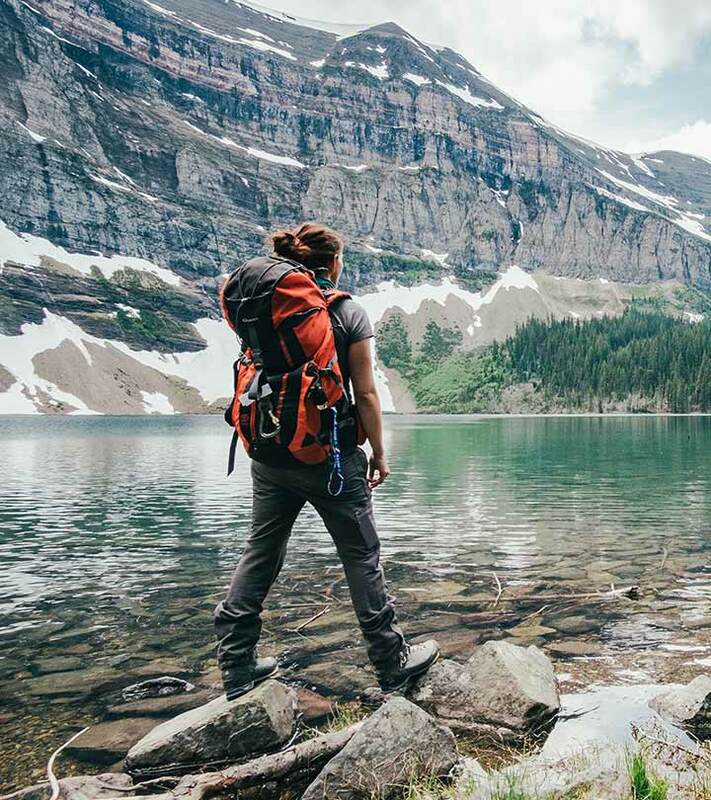 Anatomie is a brand that travelers swear by as they offer the best travel pants out there. Their luxurious fabric, high-quality tailoring, and functional design make them well worth the investment. These full-length skinny pants are breathable, figure-hugging, and have an overall slimming effect. Whether it is on a flight or a backpacking trip, these pants take you a long way (quite literally!). Lululemon is not new to anyone who is a yoga enthusiast or even remotely into fitness. 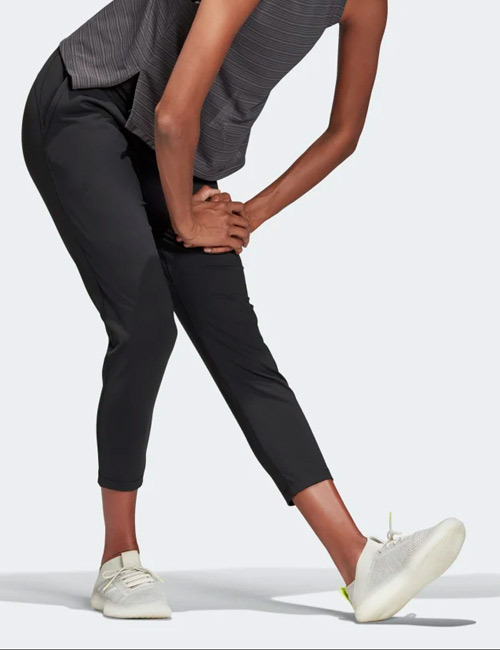 Their On The Fly Pants are more than just fitted joggers – they allow a four-way stretch for smooth movement, so you can wear them on a flight, hike, or road trip, or even while just walking around the city. They are made with a moisture- and sweat-wicking technology that keeps you dry, and their drawstring allows you to adjust them for a snug fit. Loyal to your track pants? We understand that there’s nothing more comfortable than tracks when you are traveling long distances. 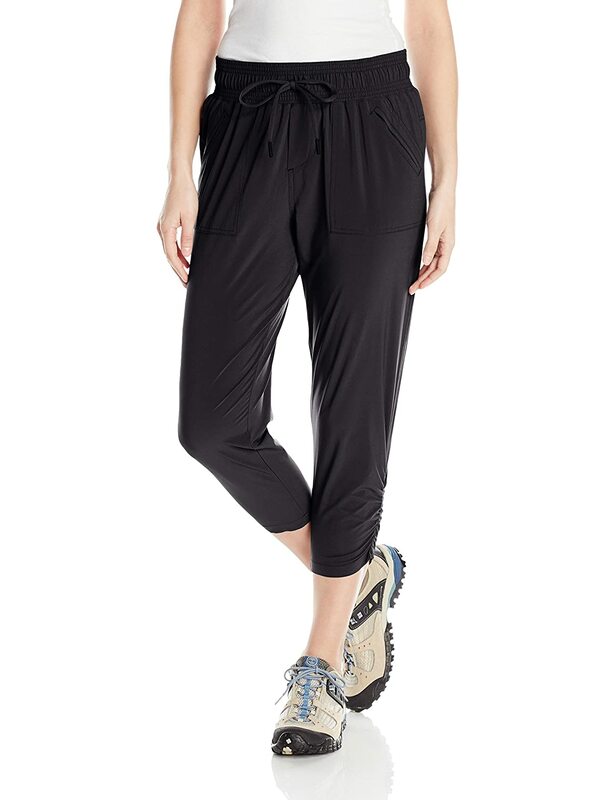 Athleta Luxe Gramercy Track Trousers have been designed keeping just that in mind. Their waistband sits snugly over your belly button without digging into your skin. The ultra-light fabric and design of these pants offer comfort, style, and breathability. Traveling in flights involves the juggle between hot and cold. So, you need sweatpants that are neither too thick nor too flimsy. Everlane Cashmere Sweatpants hit that sweet spot and will serve you just right. These joggers have a great fit and design and are everything that the perfect travel pants should be. These travel pants check all the boxes – pockets, baby-soft fabric, style, and comfort. The Siro Draped Joggers are traveler-approved, so you know you can trust them blindly. Their material is soft and flaunts the shape of your body almost perfectly without sticking to it. All in all, they are worth the investment. These trouser-style ankle-length pants from Adidas are great for long-haul flights. Their fabric is stretchy to allow movement but does not lose its shape. The Climalite jersey material keeps you dry while the tapered finish creates a great silhouette. 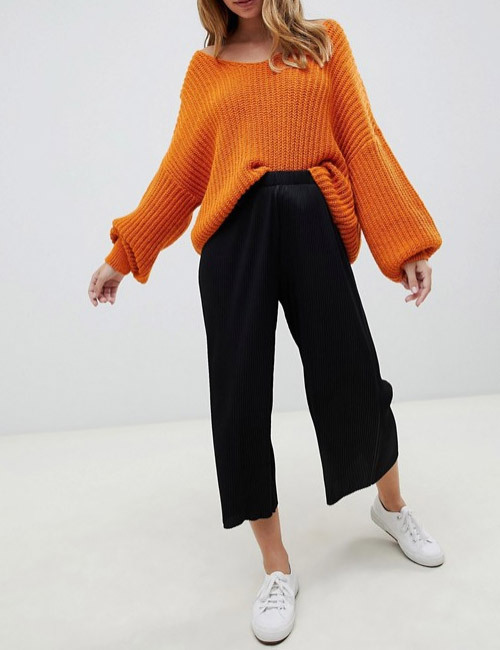 Culottes are turning out to be the front-runners everywhere – mainstream fashion, travel clothing, and business casuals. This pair by ASOS is breathable, simple, and camouflages all the right areas of your body without compromising on style. An oversized sweater, white sneakers, and these culottes make for a chic airport look. PrAna makes sustainable and travel-friendly clothing, which is a rare combination. Whether you’re going on a hike, a road trip, or a backpacking trip for a few months, you need a pair of their Midtown Capris in your suitcase. With an encased elastic band, stretchable spandex material, and moisture-wicking technology, they are undoubtedly the best in this category! Once you get used to travel pants, there’s no going back. Invest in a pair of these super comfy pants to make traveling a breeze. What are your go-to travel clothes? Let us know in the comments section below! 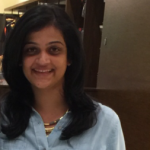 What to wear when flying long distances? The best way to deal with long flights is to layer up. Put on some breathable track pants or form-fitting leggings and a long-sleeved T-shirt, and carry a scarf/pullover/shrug/cardigan/kimono to throw on when it gets cold inside the flight. Slide-in shoes and ankle socks are the perfect footwear for these flights. What to look for in good hiking pants? Hiking pants should be a blend of breathable and dry fabric. They should be stretchable, and they should not affect your performance, chafe your thighs, make you sweat, or irritate your skin. Try out a couple of brands and use them around a little before hiking in them. Most importantly, buy pants that are specifically meant for hiking. What are the best travel pants for hot weather? Cotton pants with a drawstring and trackpants made of breathable moisture-wicking fabric that does not stick to your body are the best options for traveling in hot weather. Wear light and airy T-shirts to go with them. Steer away from jeans. Why Look Like A Slob While Traveling?